Let’s start with the biggest surprise of all, S.W. Basics Cream. This jar is filled with only three ingredients: fair trade organic shea butter, organic coconut oil and organic olive oil, and let me tell you, they work! We all know how well each of these individual ingredients nourishes the skin, but there is something special when all three are blended together and S.W. Basics has balanced them perfectly. It’s labeled as a cream, but really it’s the consistency of a balm that warms instantly in the hands. You can use it on your face, but for my purposes, this one has been doing overtime on my hands. It has even cleared up a patch of dermatitis that likes to rear its annoying head at this time of year. Even though there is no added scent to this product, I really like the how the S.W. Basics Cream smells of fresh shea butter which makes sense as it’s made of over 60% shea. If you’ve never smelled shea butter alone, it has a pleasantly nutty and slightly sweet aroma that I find very comforting. Overall, this one is a big hit! 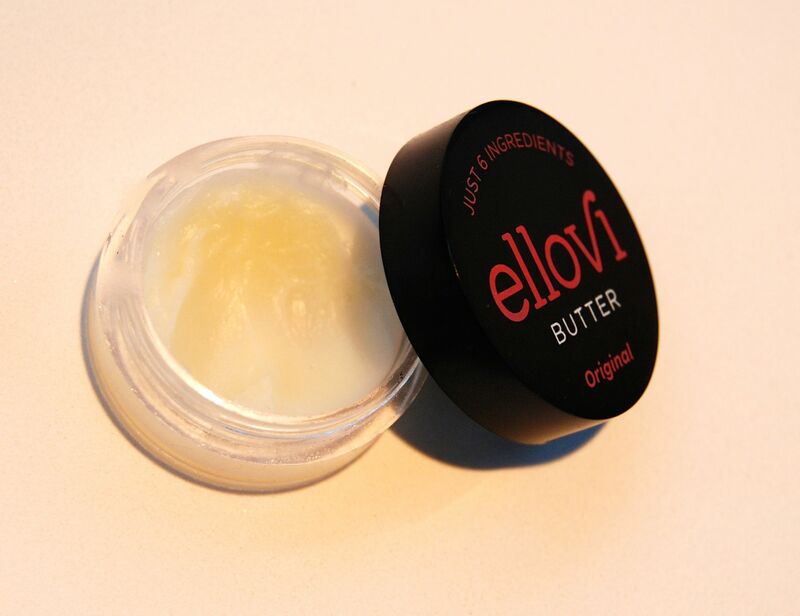 Ellovi Butter is another product that has minimal, yet highly effective ingredients. Here’s the ingredient list: macadamia, Hawaiian coconut, shea, hemp seed, African marula, and non-GMO corn starch. Like the S.W. Basics Cream, the Ellovi Butter smells mostly of shea, just a tad sweeter. It’s a little thinner than the S.W. Basics Cream, making it a great option for massages in addition to being a lovely hand or face moisturizer. Ellovi also makes a terrific lip butter that I will review later, so if you want to give their Butter a try, drop a Lip Butter in your shopping cart as well. 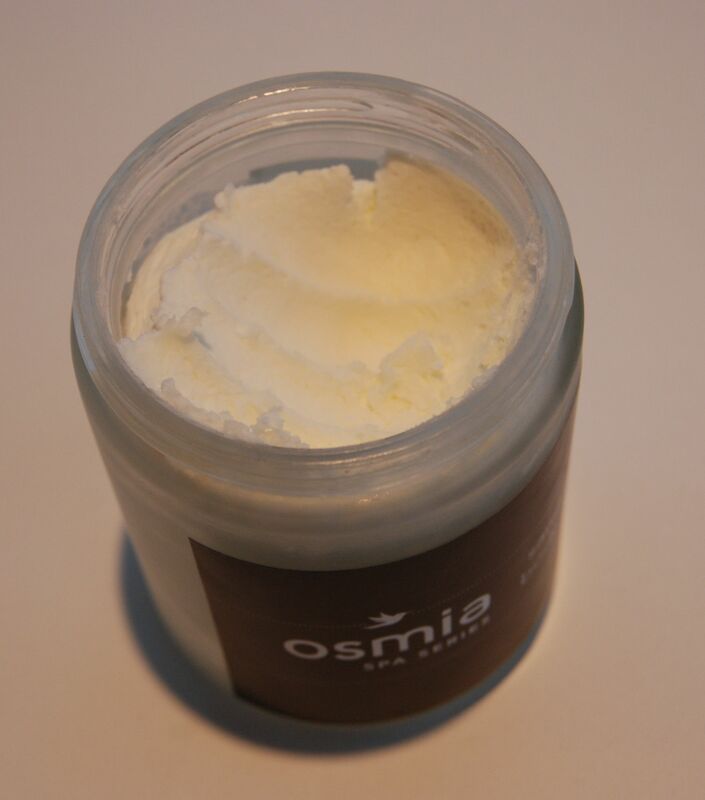 For a truly luxurious body treatment, Osmia Organics has really nailed it with their Sandalwood Body Mousse, from their aptly named Spa Series. Being Scent Hive here, I first need to mention the scent of this whipped up deliciousness. The sandalwood is perfect! Not too strong, super relaxing and has a buttery scent that is harmonious with the skin nourishing purpose of the mousse. And nourish it does. It glides effortlessly on the skin and provides instant hydration. I like to use it before bed on my hands and arms, and feel like I am giving myself an extra special treat when I do so. The Osmia website suggests massaging the mousse into damp skin just after bathing, which I look forward to trying, but I can’t seem to let this baby leave my bedside! 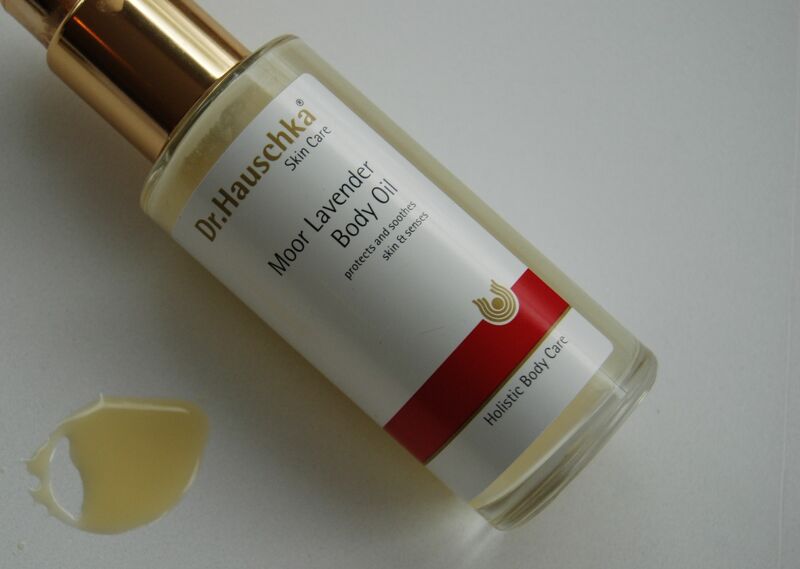 Another product that never leaves my bedside, for over three years and counting, is the highly addictive Dr. Hauschka Moor Lavender Calming Body Oil. As I tried to capture in the above photo, this truly is an oil, but a thick one that delivers shea butter in liquid form that is redolent of deep lavender. If you are a Dr. Hauschka fan, this is a must have in my opinion. And it’s 25% right now at Organaca. 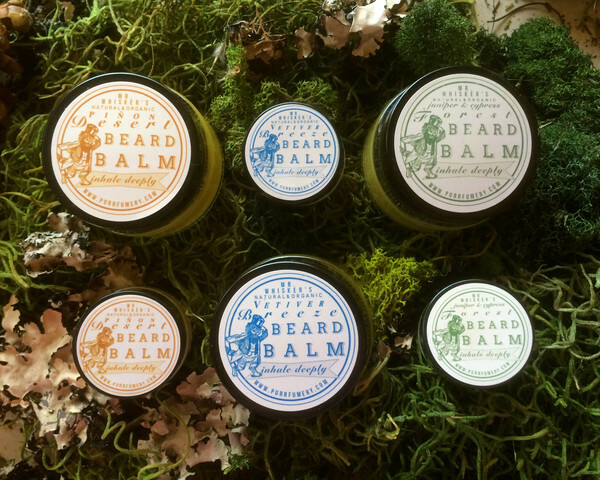 And last but certainly not least are the gorgeously scented Beard Balms by Velvet & Sweet Pea. No one in our house has a beard, so I have been using these as a hand balm, and let me tell you, no bearded person is getting these away from me! They are rich in organic oils of jojoba, avocado, rose hip seed, organic cocoa butter, beeswax from her own bees, virgin oil de coco crème, and essential oils. (You read that correctly, Laurie harvests her own beeswax!) 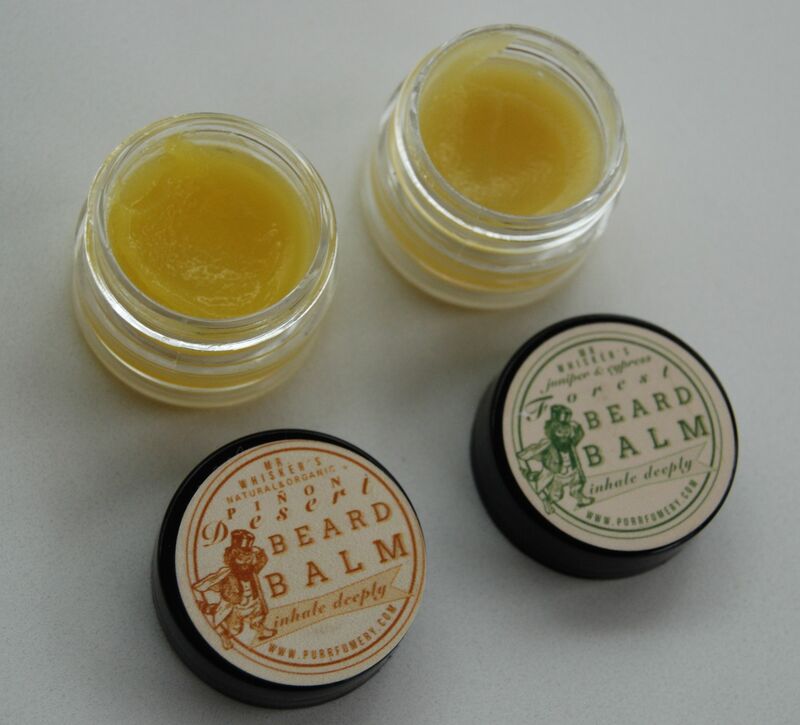 As to be expected, Laurie has created three amazing scents for these Beard Balms. Forest is scented with juniper and cypress oils, but it’s gentle in its piney and herbaceous manner, on point for this time of year. Piñon Desert is my favorite of the three, as I can’t seem to get enough sandalwood these days. Piñon pine joins the sandalwood which of course gives it a piney scent like Forest, but the piñon seems a little richer and sophisticated to me, and the balm’s fragrance has excellent longevity. Vetiver Breeze has an extraordinary aroma. If you love vetiver, then wow, this one is for you! According to Laurie, “Vetiver Breeze has a blend of three distinct vetivers, finished with a co-distillation of vetiver and a tropical flower, giving it a hit of sweet-spiciness. The balm gets its jeweled-green glint from Ruh Khus, a vetiver distilled in copper vats.” Enough said. Now for the giveaway info. Laurie will be giving one of my incredibly lucky readers a full sized Beard Balm of their choosing! That’s 1 oz of this gorgeously scented balm. ($38-$58 value depending on the scent). All you need to do is follow me on Instagram, (let me know your IG username) and leave a comment letting me know which scent you would like to receive if you are the winner! Winner will be announced on 12/21/15 via Instagram. Drawing is closed, the winner is Holly! All photos are mine, save for the last one which is courtesy of Velvet & Sweet Pea. Disclosure: Ellovi sample and Velvet & Sweet Pea samples were provided to me for review. My love for them is true and all opinions are my own. This post contains affiliate links. Yes! Definitely give them a try on your hands! Which one do you like best? Did you want to be entered in the giveaway? 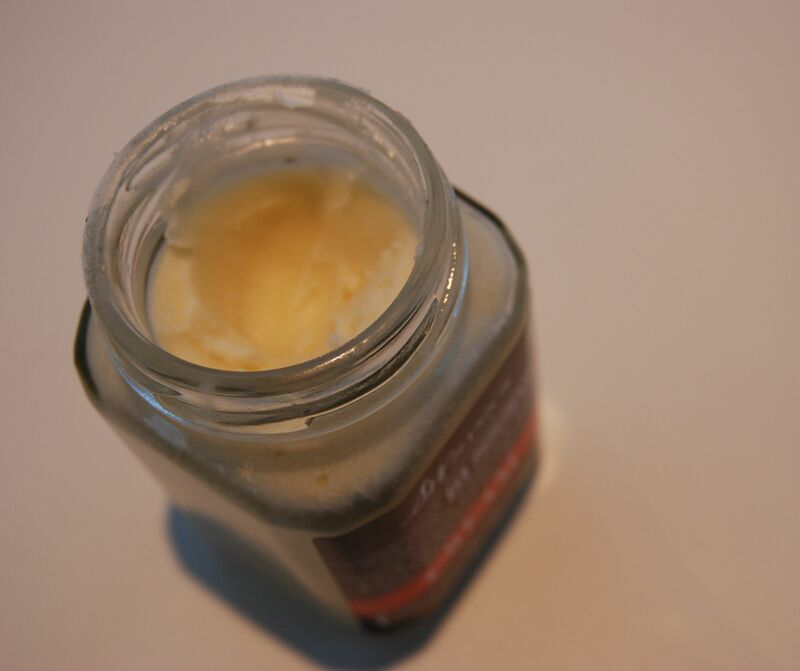 oh and meant to write that I love shea butter too (especially in the winter). It is a panacea for all skin care problems a far as I am concerned lol. The one I have been using is an unscented blend of shea butter and olive oil. So effective! I know right? And the scent of shea butter is lovely on its own. Ooooohhhhhh, no beards in this household but I won’t let that stop me! Ha! I’d love the Vetivert Breeze. I’ll be the most tranquil beardless person around! Thanks, Trish, for your wonderful review! I like it on my hands and hair too! I originally made it for my husband, who has a great beard and moustache and needed help! So great to read your posts on natural beauty again! I would love the Pinon desert or Vetiver Breeze 🙂 my instagram name is lcmoyses. Thank you for the opportunity. My Husband has a beard so maybe we could share it, I think we would both like the forest scent and I’m so happy to learn about the amazing products. And my Instagram is avosslm Thanks! My husband has a goatee so I can foist it on him when not using it as a hand balm. The pinon desert scent sounds like something he’d enjoy. I’m helenlamby on Instagram. Thanks! Following as @stephaniedavis311 and the Breeze scent sounds heavenly! Thanks for entering the giveaway Stephanie! 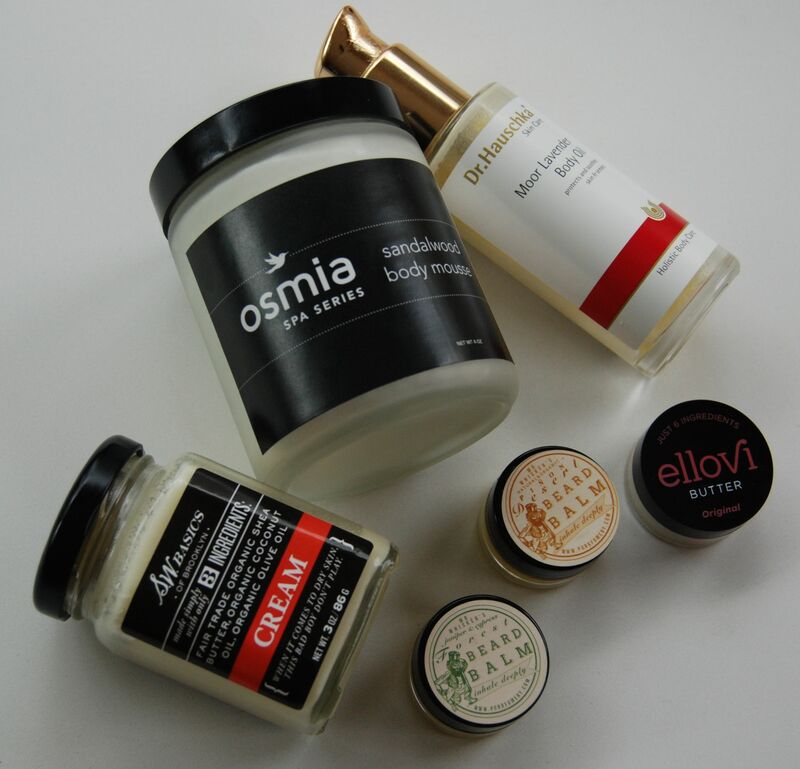 These balms are amazing and Breeze is a gorgeous vetiver. Good luck! !